The well-preserved Late Roman Bridge (3 km.) east of Limyra is one of the oldest segmented arch bridges in the world. It spans the Alakir Çayi river and marshland and is 1,181 ft. (360 m.) long! It consists of 26 segmental arches consisting of a double laid course of bricks and mortar. 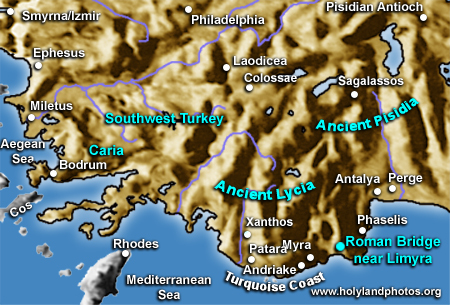 It was probably part of the Roman Road that connected Limyra and Phaselis and Attalia/Antalya. Details for this important, but not-too-well-known bridge can be conveniently found on Wikipedia.